Irbesartan—also known by its brand name, Avapro—belongs to a class of medications known as angiotensin II receptor antagonists. The primary purpose of these medications is to restrict the narrowing of blood vessels in order to improve blood flow and lower blood pressure. It is sometimes prescribed in combination with other medications that are designed to reduce blood pressure or prescribed to patients with type 2 diabetes in order to treat and prevent kidney problems associated with the disease. Since Avapro is prescribed to treat high blood pressure, patients will need to monitor their blood pressure at home or visit their physicians for blood pressure checks regularly. 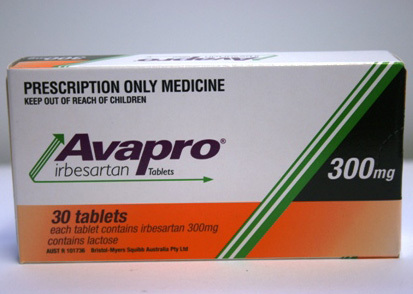 Avapro is generally taken once daily at roughly the same time of day and patients are encouraged to continue taking Irbesartan, even if they are feeling well. High blood pressure usually has no symptoms and failure to take medication for high blood pressure can result in a heart attack or stroke. Patients taking Irbesartan medications should avoid drinking alcohol, taking potassium supplements or using salt substitutes due to the increased risk for serious side effects.